After six seasons coaching at the University of Arizona, Vince Amey joined the professional ranks, joining the Alliance of American Football's San Diego Fleet organization. 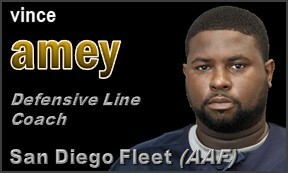 Amey was hired by long-time NFL coach, Mike Martz to lead the defensive line for the Fleet. Amey joined Rich Rodriguez's staff as an assistant strength coach at the University of Arizona in 2012. The former NFL and Arizona State defensive tackle was moved to the Defensive Analyst role in 2015, and promoted to Defensive Line coach in 2016. Amey’s first season with Arizona’s defensive line saw him develop a young and undersized unit. Hard-nosed Parker Zellers continued to be a force in the middle, forcing two fumbles and racking up three sacks despite his undersized frame. Walk-ons Justin Belknap and Larry Tharpe Jr. emerged as two promising players at defensive end in coming years, combining for 32 tackles, five for losses, along with five pass breakups. Senior team captain Sani Fuimaono capped his career by leading the front line with 19 stops. As an analyst, Amey assisted with the day-to-day duties of program management with a focus on film breakdown. Previously, he spent three seasons working with the Wildcats’ strength and conditioning staff. Amey came to the program with several years of football coaching and playing experience. Prior to his arrival in Tucson in 2012, he served as defensive line coach at Chaparral High School in Phoenix, the 2011 Arizona State Champions. In addition to coaching at Chaparral, Amey has two years coaching experience at McClintock High School, two years at Westwood High School and three years as defensive coordinator at St. Mary's (Phoenix) High School. Amey also served as the defensive coordinator of the Stockton Lightning for the 2009 season in the Arena League. He completed his bachelor's degree at Arizona State in 2010. Born February 9, 1975 in Los Angeles, Amey and his wife, Kelley, have sons Myles and twins, Dallas and Jackson.